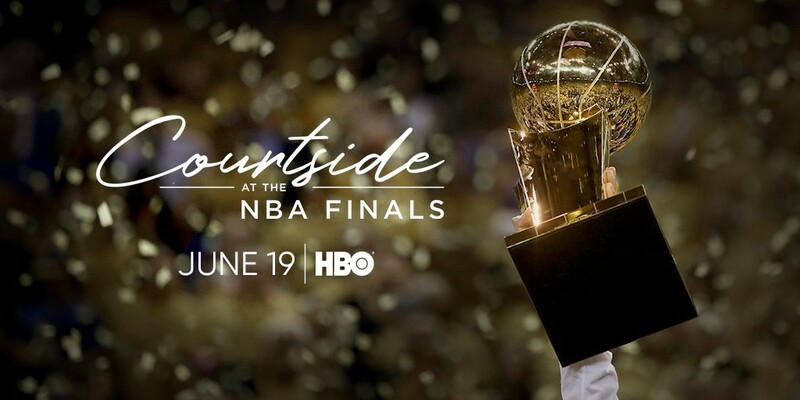 HBO Sports, one of television’s premier storytellers, is teaming up with the Bill Simmons Media Group for COURTSIDE AT THE NBA FINALS, an unscripted one-hour special chronicling the sights and sounds of the 2018 NBA Finals, debuting TUESDAY, JUNE 19 (9:00–10:00 p.m. ET/PT), with a replay that evening at 11:00 p.m. (ET/PT), on HBO. Bill Simmons will serve as executive producer. The special will also be available on HBO NOW, HBO GO and HBO On Demand. Debuting just days after the conclusion of the 72nd edition of The Finals, the show will provide viewers with a unique and unprecedented inside look at the NBA’s championship series, as the Eastern (Cleveland Cavaliers) and Western (Golden State Warriors) Conference champions compete on the biggest stage of the basketball season. Produced by HBO Sports, COURTSIDE AT THE NBA FINALS will be executive produced by Bill Simmons, founder of the Bill Simmons Media Group, which launched The Ringer in 2015. Simmons joined HBO in July 2015 and most recently collaborated on the acclaimed documentary film “Andre the Giant,” which registered the highest premiere viewership for an HBO Sports documentary in 15 years. Over the past three decades, HBO Sports has earned a reputation as one of sports television’s most prolific storytellers. From compelling documentaries to unscripted reality programming to world championship boxing to magazine-style studio shows, HBO Sports has been a trailblazer. The department has earned 11 prestigious George F. Peabody Awards for production excellence in long-form programming and introduced a host of innovations and enhancements to increase subscriber satisfaction. Since 1991, HBO Sports has also earned 135 Sports Emmy® Awards and has been recognized with four duPont-Columbia University Awards for excellence in broadcast journalism. Bill Simmons Media Group was founded in 2015 and immediately launched the multimedia company The Ringer. The Ringer consists of a website (theringer.com), Newsletter, Podcast Network (25 and growing), Social Media network, and scripted and non-scripted video production, including Ringer Films. The Ringer and HBO have collaborated on various productions, including “After the Thrones,” “Any Given Wednesday” and the feature-length documentary “Andre the Giant.” Bill Simmons received three Sports Emmy® Awards and a Creative Arts Emmy® while serving for six years (2009–2015) as an executive producer of original film productions under ESPN’s Peabody Award-winning “30 for 30” banner, and was a co-creator of the “30 for 30” series. His book on basketball, “The Book of Basketball: The NBA According to the Sports Guy,” was a New York Times bestseller. The NBA is a global sports and media business built around four professional sports leagues: the National Basketball Association, the Women’s National Basketball Association, the NBA G League and the NBA 2K League. The NBA has established a major international presence with games and programming in 215 countries and territories in 50 languages, and merchandise for sale in more than 125,000 stores in 100 countries on six continents. NBA rosters at the start of the 2017–18 season featured 108 international players from a record 42 countries and territories. NBA Digital’s assets include NBA TV, NBA.com, the NBA App and NBA League Pass. The NBA has created one of the largest social media communities in the world, with 1.5 billion likes and followers globally across all league, team, and player platforms. Through NBA Cares, the league addresses important social issues by working with internationally recognized youth-serving organizations that support education, youth and family development, and health-related causes. The 2018 NBA Finals presented by YouTube TV begins Thursday, May 31.